Written by: sarahwagner on August 8, 2018. 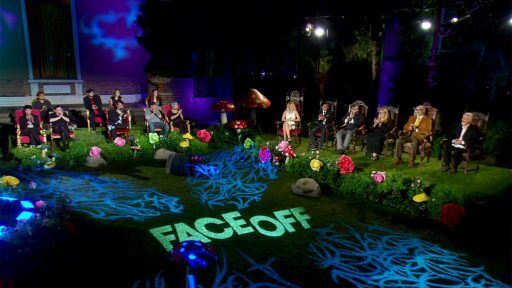 For the first part of the final Face Off finale, see last week’s recap. Tonight’s episode begins with McKenzie Westmore and John Wynn on a soundstage with an announcement for the artists. John has made a change to the script and each team will have to make a third character. I don’t see how they didn’t see that coming as that’s fairly standard final challenge stuff. The real-world Alice is going to appear differently in each of their scenes. This brings more help in the form of more past contestants. McKenzie then introduces the special guest judge, 7-time academy award winner Rick Baker for the final finale. Day one of this challenge starts with everyone reading the changes to the script. In Matt’s scene, she’s to be a wooden toy. John likes Matt’s idea and explains the special shots. At Walter’s group, he’s waiting for John to take a look at the new concepts for all of the characters before jumping in with a strong idea for Alice and they’re off and running. At Jordan’s Alice is now a bunny rabbit and as long as she can hold something, they’ve got a good place to start from. Walter is starting with the remaking of the already designed characters and has Kelly working on the basic sculpt of the Alice character. Matt is feeling pretty confident and looking to build up on what they already have but they are resculpting a few parts on the tin jester for continuity’s sake. Jordan is delegating well to cover all of the points John made at the test shoot especially the big legs for the grasshopper. The day goes by ridiculously fast. Day two starts at a run and Walter is feeling better about the direction and it’s nice to see him not being as downtrodden as he was last week. Matt is doing a decent job of delegating tasks to best get everything accomplished. Mel keeps Jordan on track and that’s a great thing because sometimes his ideas are bigger than his time allotment. We didn’t see nearly enough of day two of this three-day challenge and I really wish we’d gotten to see more of the process. On day three, Jordan starts first because his scene will be shot first and application gets underway and it’s a lot of complicated pieces and everyone is working very well in concert with each other except that there isn’t quite enough time to get everything done. Anything they miss will be done on sight which turns out to be a grand mansion. All the judges are there for the shoot in a beautiful and vibrant garden location. Baker likes the color palette. Ve loves the grasshopper’s legs. Neville loves the almost mustache. In the hot sun, there’s a lot of touchups to be done as the actors sweat their appliances off. The fox has a nice animated mouth. Alice’s hands are a disappointment and they have 5 minutes to make something work and they use fur and gloves instead. The face is beautiful though. Matt’s team goes into their final hours and everyone has their jobs and he’s feeling pretty confident. The paint is getting laid down and the pieces applied but it doesn’t feel like there is too much of a time crunch except there they did have to trim a bit of the face piece on the prince to keep the seaming down. At the end of time, Matt feels pretty confident and he should, his pieces are looking great. At the set, everyone is waiting for him to get a look at Matt’s work and they go inside the house to a throne room sort of set. Neville loves the filigree. Matt has to adjust the pull string rope and it works much better the second time around. Neville and Glenn really like the jester. He’s still feeling pretty incredibly confident at the end of the day. John is really thrilled with Matt’s work. Walter’s team is the last to go and they aren’t wasting any time. There’s a lot of thick edges going on and everything is taking more time than they anticipated. There are a lot of problems going on and a lot of creative fixes. In the last hour, they aren’t quite where Walter wants to be but he says he hasn’t given up yet. The judges get their first look and they aren’t nearly as disappointed with Walter’s looks as he is. Everyone seems to be pleased with his work. Baker and Glenn like the ballerina’s head but he has a few colors to add into Alice’s paint so that she pops a little more. The eyes are too heavy, but it looks like frosting now. They are impressed that Walter has what he has with starting completely over. At the final reveal stage, McKenzie introduces the judges: Glenn Hetrick, Ve Neill, Neville Page, and special guest judge Rick Baker. John Wynn is on the stage also. She introduces the prize package again and then the final challenge. We watch the final films which, for me, are a bit silly. In Jordan’s piece, we see Alice go through the looking glass right into a croquet match. Then we go through to Walter’s piece and seamlessly into Matt’s. I adore Walter and his work, but I think this one might just have to go to Matt. The judges speak to each artist. Walter explains his approach to the characters and how he started over and they might take into account that he did so much in half the time. Glenn didn’t really care for Alice’s face. Ve loved the ballerina character as did Rick Baker. He did deliver three strong characters and he was wise not to use the standard gingerbread man. Matt explains his characters in the throne room with the toys. Ve thought the Alice was very clever and wonderfully textured. Neville though the jester was the highlight. Rick Baker like the porcelain look of the prince. All three characters were superb and he had the best Alice. Jordan explains the intentions of his choices. Neville really liked Alice’s profile and the dapper grasshopper. Clearly, they all worked well together. The fox snout worked very well also. This challenge is perfectly suited to his skill set and it shows in the grasshopper. The Alice character head-on had some problems. Jordan has grown immensely this season. The winner of the final Face Off Finale is (insert the commercial break here!) Matt. On a personal note, I really wanted Walter to win because I like his work in past seasons and this season. I just think he let this challenge get away from him a bit and I really do think Matt deserved the win. The grasshopper was beautiful, but the jester was amazing. I have watched every season of Face Off and written recaps for the last several. I am very sad to see this show end. It was an inspiration to a lot of people and I’m sure it started the careers or more than a couple of artists. For “reality” TV, it was the best of them. Did it have its problems? Of course – the problems that arise when making giant makeups are going to be pretty similar and it’s going to feel a little formulaic after 13 seasons of oh no, the mold is stuck whatever shall we do? That was never the point of this show, we saw artists helping each other, supporting each other, while creating amazing things most of us could never even think up let alone sculpt out of clay and foam. I can only hope that someday SyFy or Netflix or Hulu or Amazon someday gives me more Face Off – I want to watch people make incredible things from nearly nothing while being kind and supportive and amazing to each other. We need more shows that show people being kind and supportive instead of backbiting and cliquey. I have had many favorite artists on this show but Tate will always be my all time favorite. Kelly, Cig, Walter, Rayce, and Rashaad all come pretty close though. And as a last completely unrelated note, does anyone else think Walter looks a bit like Mr. Incredible’s cousin?